35698 Private Harry R. Hall, 20th Battalion, the Durham Light Infantry was killed in action 26 July 1917 and is commemorated on the Ypres (Menin Gate) Memorial. He was 24 years old and is commemorated on the Etherley War Memorial and the Roll of Honour in St. Cuthbert’s Church, Etherley. By 1901 the family lived at Stone Cliffe House, West Witton, Witton-le-Wear where Robert was employed as an assistant grocer. By 1911, the family lived at Toft Hill where Robert was a self employed grocer. Harry did not live at the family home. By 1915, the family and Harry lived at Knavesmire Farm, Hamsterley and he was employed as a farmer. Harry Robson Hall enlisted at Bishop Auckland 9 December 1915 aged 22 years 11 months joining the Durham Light Infantry being given the regimental number 35698. He underwent a medial examination 20 March 1916 was 5ft.11¼ tall and weighed 140lbs. and was found to be fit for Army Service. He was a Primitive Methodist  and unmarried. Private Harry R. Hall joined the Army Reserve 10 December 1915 being posted 9 June 1916 and embarked for France 3 October 1916 and immediately was posted to the 20th Battalion, the Durham Light Infantry. 1 – 18 October 1916: the Battle of Le Transloy: 20/DLI had seen action 1 October, 7 and 8 October and was relieved 11 October  and moved away from the battle area 13 October. Private H.R. Hall may have seen action. 20 October 1916: 20/DLI moved north to the St. Eloi sector and arrived at Godewaersvelde. 24 October: 20/DLI took over trenches near St. Eloi. The Germans commanded the Wytschaete-Messines Ridge. The winter was spent in this sector. 20/DLI as part of the 41st Division was with the X Corps Second Army. 14 June: 20/DLI was in support to the 122nd brigade. The attack was successful and didn’t require assistance. 19 June: 20/DLI took over the line which overlooked Hollebeke. 20 June: German batteries were very active and battalion HQ was “shelled out” of the White Chateau. A new support line was dug by the battalion but men in the front trench were nearly waist deep in water. 20/DLI had less than 20 casualties. 24-27 June: now in support occupying the old German front line and provided working and carrying parties. Losses amounted to 15 killed and wounded. 28 – 30 June: another tour in the front. Bombing posts and Lewis guns held the line by day and much work was done at night. Rain persisted and the trenches got worse and worse. The Battalion was relieved by a unit of the 47th Division. 12 men were killed and 33 wounded including second lieutenant P.F. Large who died of wounds. 25 July: 20/DLI came into the line with their left on the Zwarteleen – Klein Zillebeke road. The men were put to work digging their assembly trenches and dumps for battle stores. “C” Company occupied forward posts on the slopes of Fusilier Wood and “D” Company was in support. 26 July 1917: a fairly quiet day and the cost to the battalion, “only 8 casualties” , one of whom was Private H.R. Hall who was killed in action. 42545 Private W. Magson, 20/DLI died of wounds on the same day. Private H.R. Hall served a total of 1 year 250 days. Private H.R. Hall was awarded the British War and Victory medals. Private H.R. 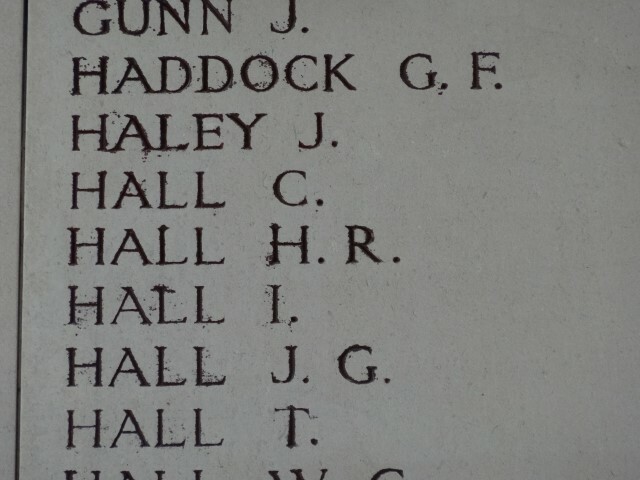 Hall has no known grave and is commemorated on the Ypres (Menin Gate) Memorial. The Memorial is situated at the eastern side of the town on the road to Menin (Menen) and Courtrai (Kortrijk). 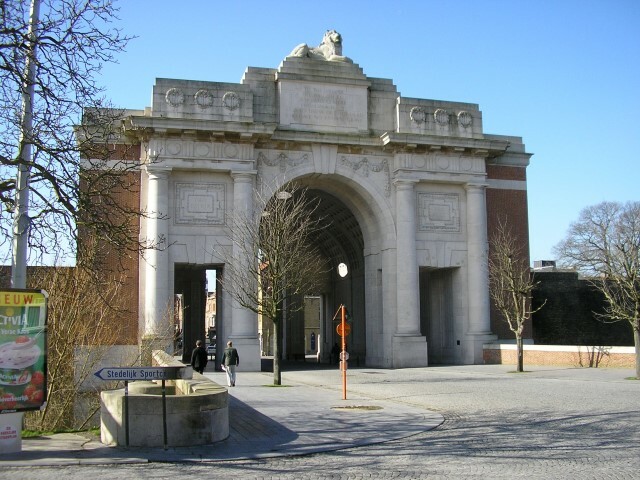 The Menin Gate is one of 4 memorials to the missing in Belgian Flanders which cover the area known as the Ypres Salient which stretched from Langemarck in the north to Ploegsteert Wood in the south. The Salient was formed during the First Battle of Ypres in October and November 1914.